Until recently, Cookie Doughmen were considered imaginary creatures, thought-up to keep young Scoopians from venturing into Cookie Cavern. However, Radley Madish was surprised to find a small army of Cookie Doughmen living deep within the network of caves. He quickly enlisted them to fend off any intruders who would venture into the depths of the caverns. 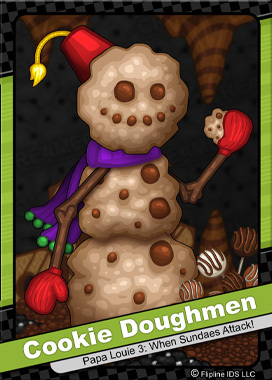 They are known to use tightly packed cookie dough balls to hurl at any oncoming outsiders.